The Kurds, along with Israel and Jordan are America’s only reliable and proven allies in the Middle East and we should support a free and independent Kurdistan. Please tell us where you stand by taking our poll on the U.S. role in Kurdish independence. So, why are President Donald Trump’s State Department and National Security Council about to abandon them to the tender mercies of our enemies in Iran and an increasingly hostile Islamist government in Turkey? The Iraq that we are ostensibly trying to maintain doesn’t exist as a sovereign nation anymore. Indeed, as Horowitz pointed out, it only existed for a few generations, drawn together randomly after WWI by immoral, arbitrary lines that ignored the self-determination principles enshrined in the Treaty of Versailles. Once we overthrew Saddam Hussein, a feckless President Obama handed control of the territory we call Iraq to Iran and for all practical purposes a sovereign Iraq ceased to exist. We’ve spent over a decade refereeing the Islamic civil war between Iranian-backed Shia militants and Sunni jihadists says Horowitz. Now, in order to “defeat ISIS,” we have essentially allied with Iran, handing them a Hezbollah terror corridor from Iran to the Mediterranean Sea. The Kurds are our only allies in the region with forces on the ground capable of fighting the Iranian jihadi super-state that the ayatollahs are building in the Middle East. They are a successful on-the-ground fighting force against the jihadis, and they are also pro-American and can actually hold a growing area of northern Iraq in a stable way that serves every one of our interests. And they voted overwhelmingly to become independent. The Iraqi Kurdistan Regional Government (KRG) declared victory earlier this week when the population voted 93 percent in favor of Kurdish independence. Please tell us where you stand by taking our poll on the U.S. role in Kurdish independence. All the Kurds need are national recognition, a fraction of the military aid we give the corrupt Afghani and Baghdad governments, and the simple, helpful tools of statecraft we’d give to any allies. The Kurds are also on the cusp of winning back even more territory than they originally lost to Sunni jihadists. After we spent tens of billions training the “Iraqi army,” it fled the minute ISIS attacked, noted Daniel Horowitz. Now that the Kurds are winning back their original land, which had been stolen by Arab Baathists for the past half-century, why are we siding with Baghdad to pressure them to pull back? Rather than a bloody choice between helping Iran and helping Sunni jihadists, with the loss of tremendous blood and treasure, we can and should help a stable ally almost for free, says Horowitz. Yet not only are we not helping, we are rebuking the Kurds for taking up their sovereignty. The State Department said it was “deeply disappointed” by the democratic affirmation of sovereignty. This has emboldened the Iranian puppet government in Baghdad government to cut off all flights to Erbil airport, the Kurdish capital. Our government is literally siding with Iran and Shiite militias, some of which are designated as terrorist groups, in their dispute with the Kurds over Kirkuk. We are also allowing Baghdad to hold up foreign aid for them while we refuse to cut off aid to the Lebanese Army at a time when Iran’s puppet Hezbollah is more empowered than ever before. What’s more, Turkey’s Islamist President Recep Tayyip Erdoğan has threatened to cross his county’s border and attack the Kurds in their homeland. The Kurds are the biggest buffer against Iranian hegemony. Yet, NSC director H.R. McMaster won’t say what the administration’s strategy is to stop Iranian and Hezbollah expansion in the region, which was accelerated by our own military intervention on their behalf. Now the Kurds have the ability to undermine the Iranians. Iranian Kurds are already celebrating the move toward independence and rattling the Islamic republic. The question nobody in government is willing to ask is: How much longer are we going to continue throwing good money and lives after 16 years of failure in Iraq and Afghanistan? How many opportunities will we ignore while fighting for foreign Islamic countries that no longer exist? Many Kurds live outside the area of northern Iraq where one vote took place. And the governments currently controlling the other Kurdish areas – the authoritarian regimes in Turkey, Iran and Syria – are no happier about the Kurds’ vote for independence than is the Iranian-dominated one in Baghdad. We are already in a proxy war against Iran that stretches across the entire the Middle East. An independent Kurdish state is in America’s strategic interest, especially if, in the process, it weakens hostile regimes, such as Iran and Syria. Starting with diplomatic recognition and support we should be prepared to render whatever assistance is necessary to preserve Kurdish independence. Please tell us where you stand by taking our poll on the U.S. role in Kurdish independence. Mir Jafar is the pen name of a conservative observer of Middle East politics and policy. Submitted by Charles Martel on Thu, 10/26/2017 - 00:20. 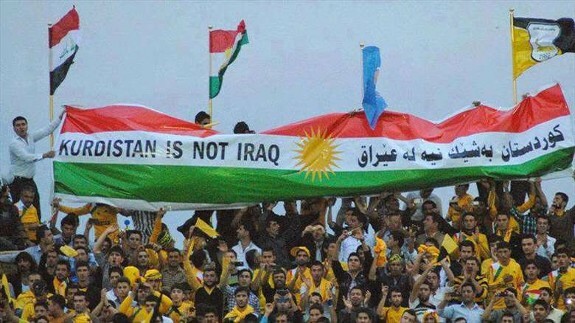 Yes, we should support an independent Kurdistan, but not "by any means necessary." The Kurds have been our most reliable allies in the region, second only to the Israelis. But to fight their battles for them (or even with them) would be to do the same thing as we have done in Afghanistan and Iraq: make our allies dependent on us, then leave them twisting in the wind when the political wind in the United States shifts. Our alliance with the Kurds in the fight against ISIS now gives us political cover to support them militarily, but not for much longer. In that respect, we should help them as much as we can while we can. Before long that will no longer be feasible, and then we won't be able to do more than advocate for them at the U.N. and elsewhere. At least that will be more than the Traitor-in-Chief Obama did for the Iranian dissidents in 2009-2010, when a little moral support could have helped them overthrow the ayatollahs. Sometimes the most important type of courage is the moral courage to stand up for what's right when it's not our battle to fight militarily. Submitted by email_registrat... on Wed, 10/25/2017 - 15:32. 4)	The different people of South Slavs (Slovenians, Croatians, Bosnians, Montenegrins, Kosovars, mixed peoples of Vojvodina) were given to the Kingdom of Serbia. These “peaceful” results of the “Peace Conference” inevitably caused several bloody wars in the relatively near future. In Germany the continued depression and incredible inflation produced Hitler and a new re-armed Germany hungry for revenge, with the resulting Second World War. Hitler started by retaking the German portions of Poland, with the help of his temporary ally the Soviet Union. He then attacked France and formally annexed Alsace and Lorraine; he crushed Czechoslovakia and annexed Sudetenland. Using the excuse of Yugoslav resistance he eliminated the Serbian kingdom, annexed Slovenia, established the quisling republic of Croatia, joined Vojvodina to Hungary, and ruled Serbia itself under the German army occupation. After the defeat of Germany a new Yugoslavia was re-established under a Tito-led communist government. Of contemporary interest is the British decision to economize the occupation of those 3 former Turkish provinces of Kurds, Shias, and Sunnis by combining them into a new entity by the name of Iraq. There is now ongoing war between these 3 factions. Of special interest to me are those two cases of unnatural combinations – Yugoslavia and Iraq. The fall of communism produced a lengthy internal war in Yugoslavia with about 300,000 victims, resulting in separate states of Croatia, Slovenia, Serbia, Montenegro, Macedonia, and Bosnia-Herzegovina. The ongoing war in the so-called Iraq will only end with the establishment of separate states of Kurds, Shias, and Sunnis. Let us also remember another false combination – Czechoslovakia – another artificial Versailles two-language combination that could not withstand the test of time; now we have two new countries: the Check Republic and Slovakia.